Don’t struggle with what to make for dinner when the kids go back to school. 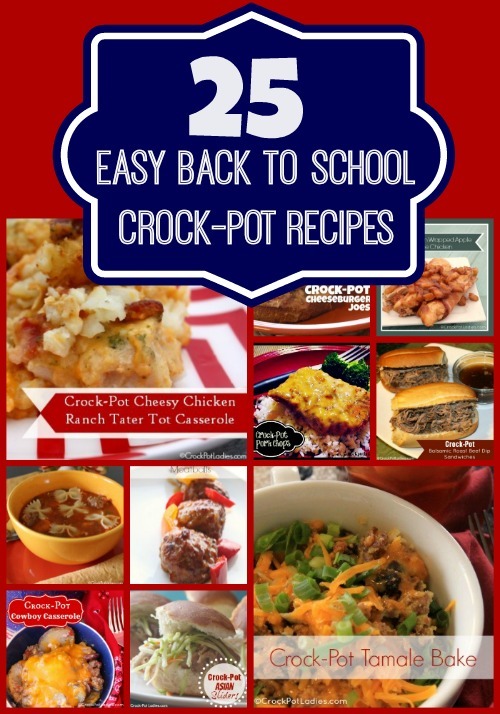 This collection of 25 Easy Back To School Crock-Pot Recipes is full of easy to make kid friendly dinners that everyone in the whole family will love! It is that time of year, the kids are going back to school and that means lazy summer evenings pass away to a bit more hectic schedule. At our house the hours between 3:30 (when the kids get home from school) and 8:00 (when they go to bed) is what we call “Crunch Time”. It is just pure craziness. The kids are all getting home and are wound for sound with exciting stories to tell me about their day. They are hungry for a snack and then it is time for homework and getting dinner ready. The crew gets fed and then we have our daily chores and then we start winding down for the day with baths and showers, hunting, gathering up outfits for the next day, unwinding maybe with a little TV or iPad time and then off to bed. One of the ways I alleviate the stress for this crazy part of the day is meal planning and utilizing the crock-pot as much as possible. Meal planning is important because it allows me to be organized about what I am making on each day and while grocery shopping. It sure is easier to get everything I need at the grocery store in one trip versus making several trips to the market for forgotten ingredients. And that saves me money too. 25 Easy Back To School Crock-Pot Meals using my slow cooker is super helpful too because instead of me rushing around the kitchen with kids underfoot and needing my attention while I am trying to cook, I can instead get my prep work done either the night before after they go to bed or in the morning after they hop on the bus. And frankly that works better for me because I am a night owl so prepping at night works for me, or in the morning after I have a couple of cups of coffee in me…yep just a more productive person overall! And the, I can give my kids my full attention with homework and snacks and whatever else they need instead of feeling crazy! Enjoy this time with your little ones…they are only kids for such a short period of time! More great recipe collections you will love! I just wanted to say that I absolutely love this page, I stumbled across it looking for crock pot recipes. Ones that worked and tasted good. Some of the recipes on this page are all time family favorites! Thank you! Thank you! do you ladies have any recipes adapted for use in the crockpot casserole slow cooker? Just wondering about converting layered dishes like the tater tot ranch chicken…how does it work “spreading ” the ingredients out over a larger space than a regular crock. Probably an easy fix that I’m not seeing right now. Love your page. While I have not cooked this specific dish in the casserole crock-pot I think it should work just fine. We have a few recipes here on our blog for the casserole crock-pot. Not many yet. But we are working on it.